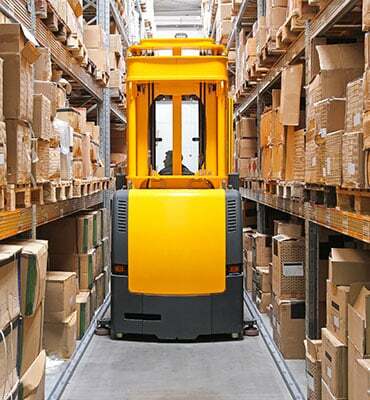 Simplify your operations with fast-charging lithium-ion batteries from Flux Power. “I am very impressed with the performance of the Flux Power packs. Their team did a great job on the design. It's aesthetically pleasing and easy to use with a clear display of the battery charge. It's very robust and capable of outperforming our 510 A/hour lead-acid batteries." Who Is Using Flux Power Technology? “The benefits of the Flux battery technology, in terms of size, capacity and safety, should enable better operating performance and acceptance by mine operations and unions." What is the Flux LiFT Pack Battery made from? The LiFT-24V pack is built from large format prismatic lithium-ion cells. The cells are constrained against shock and vibration in a 10-gauge steel enclosure. Battery interconnections are made with flexible bus bars and AWG 2-high strand cabling. The schematic to the right details all major components of a LiFT Pack. What does the State of Charge Gauge tell me? 1) When the lights are static, the LEDs act as a battery discharge indicator (BDI). 2) If there is a single light flashing, it is displaying a Device Trouble Code (DTC). 3) If the lights are turning on in series, it is confirming the pack is charging. Is there a Battery Discharge Indicator (BDI) on the pack? Yes, there is a State of Charge (SOC) gauge on the pack. A series of LEDs indicate the batteries state of charge from 0-100%. What are Device Trouble Codes (DTC)? If the pack is trying to operate outside of its limits, the BMS will cut power to the pack and blink a single specific LED related to the DTC. The diagram to the right details the DTCs associated with each light. What are the effects of temperature on capacity and operation for both high 55 °C (131 F°) and low temperatures 0 °C and -20 °C (32 °F and -4 ˚F)? The supported discharge temperature range is -20 °C to 55 °C (-4 ˚F to 131 ˚F) and supported charge range is 0 °C to 45 °C (32 ˚F to 131 ˚F). At 55 °C (131 ˚F) the available capacity is 100%, at 0° C (32 ˚F) there is 75% available capacity, and at -20 °C (-4 ˚F) there is 41% available capacity. Constant operation at 55 °C (131 ˚F) will reduce the battery cycle lifetime by >20%. Is the temperature range of -20 °C to 55 °C (-4 °F to 131 °F) the operating internal temperature of the pack or the ambient temperature? This is the internal temperature. There are temperature sensors inside the pack which monitor the operating temperature. If the temperature range is exceeded, the buzzer will sound and the pack will automatically shut off until the pack is allowed to cool/heat to within operational parameters. What is the temperature increase during use of Flux LiFT Packs compared to Lead-Acid? Flux LiFT Packs experience almost no temperature increase during charging and discharging. Tests run by Flux Power indicate flooded lead-acid temperatures increase 27% more and AGM increase 47% more than Flux LiFT packs during a 1 hour (1C) discharge. This is due to the lower internal resistance of lithium-ion vs. lead-acid, and means the battery wastes less energy when charging and discharging. Can Flux LiFT PacksTM be opportunity charged? Yes, Flux LiFT Packs can be plugged in at any state of charge with absolutely no negative effects. In fact, opportunity charging can actually increase the lifetime amp-hour output of the battery. The pack does need periodic balancing, which can be done by plugging in overnight or over the weekend once per week. What happens when the pack runs out of charge? When the battery reaches 10% SOC, a beeper will sound notifying the operator that the battery must be charged. Once the battery reaches 2-3% SOC, the beeper will sound again to notify the operator again that the battery needs charging. Finally, it will cut power intermittently and allow the pallet jack to be slowly driven to a charging point. We recommend plugging the pack in as soon as the initial buzzer sounds to prolong the life of the battery. 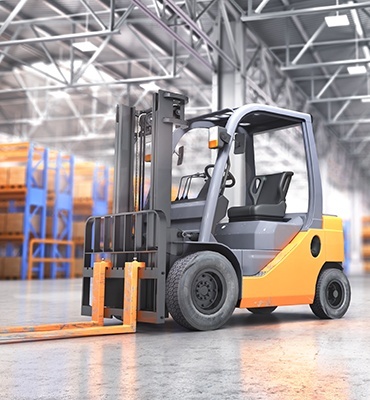 If the pack is not plugged in and left sitting in an uncharged state, it is possible the lithium cells will be permanently damaged and no longer function..
Do I need to disconnect the LiFT Pack from the walkie/pallet jack to charge it? If the LiFT Pack has an internal charger it does not need to be disconnected from the walkie to charge it. The pallet jack will not be operational while the battery is charging. 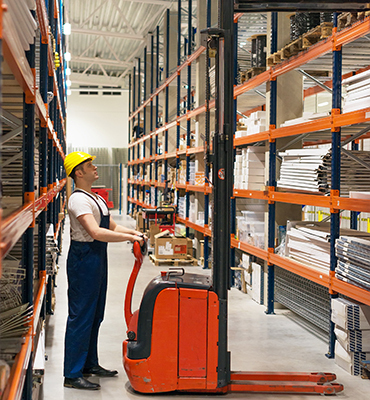 If the pack is plugged in for charging, is the walkie/pallet jack operational? No, the walkie is not operational. Unplug the extension cord to re-enable the battery/truck. At what temperatures can I charge and discharged a Flux LiFT Pack? Flux LiFT Packs should only be charged from 0°C to 45°C (32°F - 113°F) and discharged from -20 °C to 55° C ( -4°F to 131 °F). Is it OK to leave the LiFT Pack plugged in? Yes, the Battery Management System (BMS) monitors charging so the battery will never overcharge. Flux actually recommends leaving the charger plugged in when not in use. Can you overcharge or over discharge the packs? Flux Power’s patented Battery Management System (BMS) monitors charging so that the pack cannot be overcharged or over discharged. The only risk is if someone fully discharges the battery pack and then does not plug it in. In this case, because of the small parasitic draw from the electronics, it is possible to completely kill the pack. This is why we recommend the packs remain plugged in whenever not in use for more than a few days. There is no harm in leaving the packs plugged in, but great harm if they are left discharged for extended periods of time..
What type of charger and charging profile is used in the LiFT Pack? The onboard charger is a high-frequency BMS controlled device. It will charge at constant current until the pack voltage reaches 28.55V and then use a float voltage of 28.55V to finish charging and balancing. Can a lead-acid charger be used to charge the Flux battery? Flux LiFT Packs require a higher charging voltage than lead-acid and come with an onboard charger. 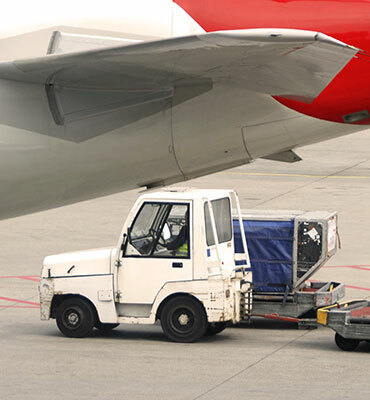 However, in some instances, a lead-acid charger can be used to partially charge the LiFT Pack – but for optimal performance, always use the onboard charger. Is the charger CEC (California Energy Commission) approved/rated? Yes, the internal charger is CEC compliant. How much current does the LiFT Pack onboard charger draw? It is a 775W charger, so the current draw is dependent on the supplied voltage. If the socket supplies 130V, the charger will draw 6A. If the wall socket supplies 110V, the charger will draw approximately 7A. Standard US electrical outlets supply a range of voltages, depending on the distance from the transformer. What type of cord is used for charging? A regular 120VAC extension cord is used for charging. 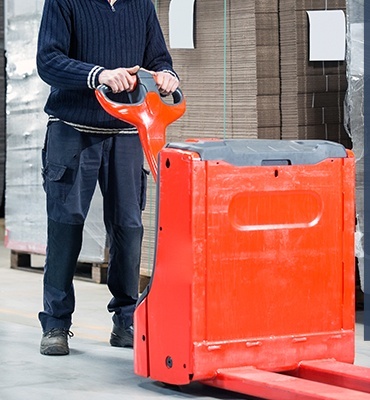 The LiFT Pack ships with a 10ft cord. The charger requires 105-130V to function properly, so use a wire sizing guide if you wish to use a longer extension cord. At what depth of discharge (DOD) does the battery experience 1 cycle? There is no point at which a discharge counts as 1 cycle. Each cycle puts wear on the battery proportional to its depth of discharge. If the battery is discharged to 80% every cycle, it will last ~ 2000 cycles. If the battery is cycled at 70% DOD, the battery will last ~3,000 cycles. In reality the total lifetime output numbers will be closer together, as factors such as battery aging are not being considered. However, the 70% DOD battery will still output more Ah over its lifetime. This is the main reason why opportunity charging is a perfect fit for LiFT Packs. 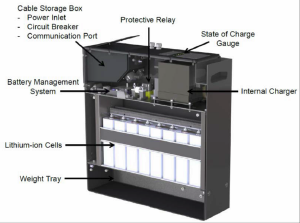 What types of Lithium-ion chemistries are available, and why do we use LiFePO4? There are a number of different chemistries available. Flux uses LiFePO4 due to its long cycle life, low cost of ownership, thermal stability, and high power output. Below is a chart which provides some information on alternative Lithium-ion chemistries. What “wears out” in Lithium-ion batteries? As lithium iron phosphate cells cycle, the charge is carried between the anode and cathode using lithium ions. As the pack cycles, a very small percentage of the mobile lithium ions are caught in irreversible side reactions. This reduces the amount of charge transfer possible between the electrodes. In lead-acid, this is somewhat analogous to sulfation, where the sulfur becomes locked in stable lead sulfide crystals and can no longer intercalate into the lead plates. Sulfation is worse, however, as it occurs during use and during storage. The crystals can grow and crack the plates, and block electrolyte access to the plates. What is the electrolyte in these batteries? Flux lithium batteries use an electrolytic salt dissolved in organic solvents. What is the specific gravity of Flux lithium batteries? Specific gravity is not relevant for lithium batteries. Generally, specific gravity is used to measure the density of lead-acid electrolyte against water. Lithium batteries are sealed and maintenance free, so there is no way to measure the electrolyte and no water is used. What are the positive and negative active materials? The cathode (positive electrode) is lithium iron phosphate with a copper charge collector, and the anode (negative electrode) is graphite with intercalated metallic lithium and an aluminum charge collector. Intercalation is the insertion of lithium ions into the anode and cathode material. What are the chemical reactions occurring within a Flux lithium-ion battery? Does the lithium battery pack have a positive and negative grid like lead-acid batteries? Lead-acid uses a lead plate and a lead dioxide paste that must be supported by a structural grid as their anode and cathode. Flux lithium-ion batteries have an anode and cathode, but no grid is used as there is no lead dioxide paste. What is Ahe vs. Ah? It is difficult to compare a lithium-ion and lead-acid battery when only looking at amp hours. Flux Power uses amp hour equivalent to give a better estimate of the run-times you should expect. The voltage is higher and stays higher, meaning there's more energy (kWh) in the battery pack for a given amp hour rating. In addition, the pack is lighter and the chemistry is more efficient. So, you save energy while charging, discharging and running the equipment. You can also drain more of the energy from the battery without serious effects. Meaning for identical amp-hour ratings, lithium will run longer. This is why we call our 100 Ah lithium pack a 135. It will run as long (or longer) than a 135 Ah lead acid. What do I need to know to ship a LiFT Pack? Similar to lead-acid, there are packaging instructions which must be followed when shipping. A LiFT Pack must be shipped in accordance with UN3480, Hazard Class 9, packaging group II, instruction 965. If the pack is shipped in equipment, use packaging instructions 967. If you need further assistance, please contact your FLUX Power representative. What do you do with the batteries at the end of their life? Is there a recycling program? Recycling methods are currently being developed, with reports of 60% recyclability at the cell level. Lithium batteries are the future of energy storage, and recycling efficiencies are predicted to climb to >90% as the markets scale and additional recycling methods are developed. Until a mature recycling program is available, Flux Power agrees to take back any battery at the end of its usable life for either recycling or repurposing. Also note that because lithium-ion batteries have a much longer life span than lead-acid, there will be dramatically fewer batteries subject to recycling over time. If you require more detailed information regarding recycling, please contact your FLUX Power representative. Do the packs require watering? No, Lithium-ion batteries do not require watering. They are completely sealed and produce no gas when charging. In addition, the electrolyte is made of organic solvents, so water should not be used. Do LiFT Packs require periodic maintenance? No, but an annual inspection is recommended by an authorized dealer to ensure maximum battery health and life. What have you done to verify the pack will physically last 5 years? The pack has been through extensive abuse testing for UL 2271, UN 38.3 and OEM testing and approval. The pack has a design life of > 7 years and is protected by our full 5-year warranty. Are Flux lithium batteries safe? There are a number of factors responsible for the remarkable safety of Flux lithium batteries. 1) The selection of battery chemistry is important. There are a number of Lithium-ion chemistries to choose from, and each has unique properties. Flux has chosen lithium iron phosphate (LiFePO4) for a number of reasons. Most importantly LiFePO4 is chemically stable and has the highest thermal runaway temperature of any lithium-ion chemistry at 270 °C (518 ˚F). The news stories of cell phone and laptop batteries catching fire were a cobalt-based chemistry that is less chemically stable. These batteries are also in a small cylindrical cell format. 2) The lithium cells used are in the form of large pouch and prismatic cell technology versus cylindrical cell. The pouch and prismatic cells contain >20 Ah versus the 2.5 Ah in cylindrical, meaning LiFT Pack batteries have up to 10 times fewer power connections. In addition the cells are connected with flexible bus bars, meaning they are extremely vibration resistant. 3) The use of Large Format Cells means there are far fewer cell taps and temperature sensors. This system is less complex and inherently safer. 4) The BMS monitors the cell temperature and current and shuts the system down, if it detects anything which may cause harm to the battery. This is to maintain battery performance and expected lifetime. What happens if the pack is breached, what leaks out and is it dangerous? The lithium cells are first encased in hard plastic, and then an industrial 10-gauge powder-coated steel case. If a user punctures through all of these materials and exposes the lithium cell electrodes and electrolyte, be cautious when handling. The electrolyte consists of organic solvents (EC, PC, DEC) and a dissolved electrolytic salt (LiPF6). They are skin and eye irritants, and fumes can cause mucus membrane irritation. The solvents are flammable, so do not expose to an open flame. Use rubber gloves, eye protection, ventilation and positive pressure breathing protection when removing the damaged battery and electrolyte. In addition, LiPF6 is hydrophilic and reacts with water-releasing hydrogen fluoride, a corrosive flammable gas. If a fire does occur, use a CO2 or chemical fire extinguisher. Will the batteries catch fire? Flux Power uses lithium iron phosphate (LFP) in its products as it is a very stable chemistry. The burn temperature is over 500˚F, much higher than other chemistries, such as lithium cobalt at 149 ˚C (300 ˚F). The chemical stability also provides long cycle lifetimes (2000 at 80% DOD). In addition, there are safety measures built into the pack which prevent overcharging and rapid discharging. Finally, the battery case is made of high grade steel, protecting the cells from damage, and containing them should a cell breach occur. All of these protections mean that under normal usage, there is no danger of a fire. The dangers of spills and explosive gas buildup from lead-acid batteries are much more common than a LiFT Pack catching fire. The LiFT Packs are shipped in storage mode, to activate the pack, close the circuit breaker by folding in the yellow tab, as shown in the guide included with the battery. If you wish to store your battery for a long period of time, fully charge the battery and then press the red button in the cable storage box. This will allow the battery to be stored for up to 1 year before requiring a recharge. 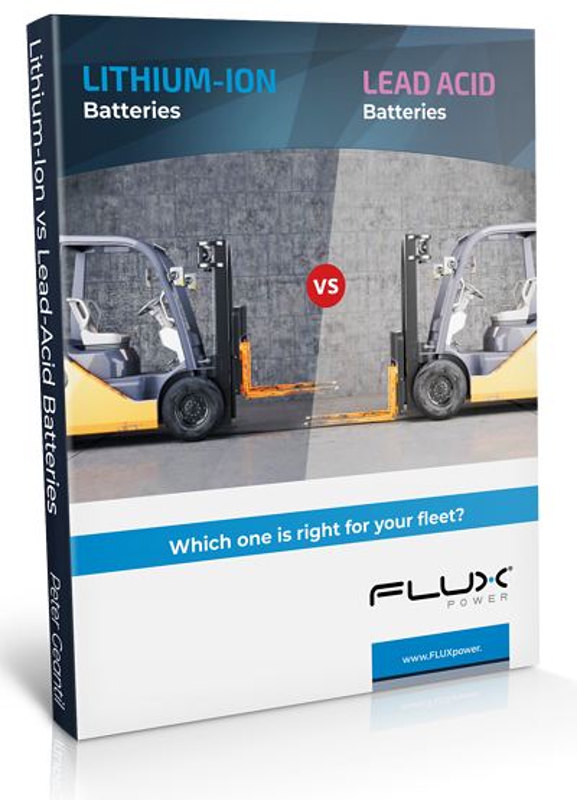 What happens when a single cell fails in a lead-acid battery vs. a Flux lithium battery? When a single cell fails, there is no BMS to manage the charging. Therefore, the failing cell will heat up, but not fully charge. The failing cell will accelerate its decline as it is used improperly and cause the entire pack to drain rapidly when in use. As an example, if a failing lead-acid cell is at 50% capacity, the charger will not attempt to charge it to its full (diminished) capacity, this means that once the pack is used, the voltage drop will be significant in this cell, and the entire pack will see a drastic drop in run-time due to the low voltage in this cell. When a single cell begins to fail, the entire pack will experience a reduction of run time proportional to the single failing cell’s reduction in run time. The BMS will still charge and balance the cells, but the pack will cut off when the failing cell voltage drops to 2.8 Volts. As an example, if the failing cell is at 50% capacity, the charger will still charge the cell to full (diminished) capacity and the cell will produce the expected voltage, just for 50% shorter run-time. The pack will then run as if it has 50% capacity. The BMS will protect the other cells from harm due to a low cell. In essence, the BMS avoids the low voltage scenario which is problematic in lead-acid. How does a dealer diagnose a battery should an issue arise? The State of Charge indicator lights also display Diagnostic Trouble Codes (DTCs), which are detailed in the Quick Start Guide and this FAQ. If for some reason the problem cannot be determined using the DTCs, Flux will provide communication cables and software to connect to the pack for a more detailed inspection of the issue. The onboard firmware provides detailed reports of all cell and pack behavior, making diagnosis of a problem quick and easy. Why does the Flux product specification sheet show a voltage higher than 24V? Lithium cells have a higher nominal voltage than lead-acid. The Flux LiFT pack is comprised of 8 Lithium cells connected in a series, each with a nominal voltage of 3.2V. The pack nominal voltage is therefore 25.6V. There is minimal voltage drop as the pack discharges. And under normal use, the pack will indicate it needs to be charged when it drops to ~23-24V. How can we offer a 5-year warranty? Based on average usage profiles and Flux lithium battery packs lasting 2000 cycles, Flux expects the LiFT Packs to last 7 years before they are at 80% of their original capacity. 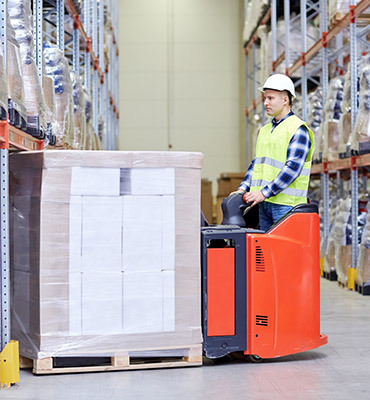 If an end user is running the pack 24/7 and cycling the pack 3 times in a 24-hour period, there may be additional decreased capacity after the 5-year mark, but the pack will still function as intended. 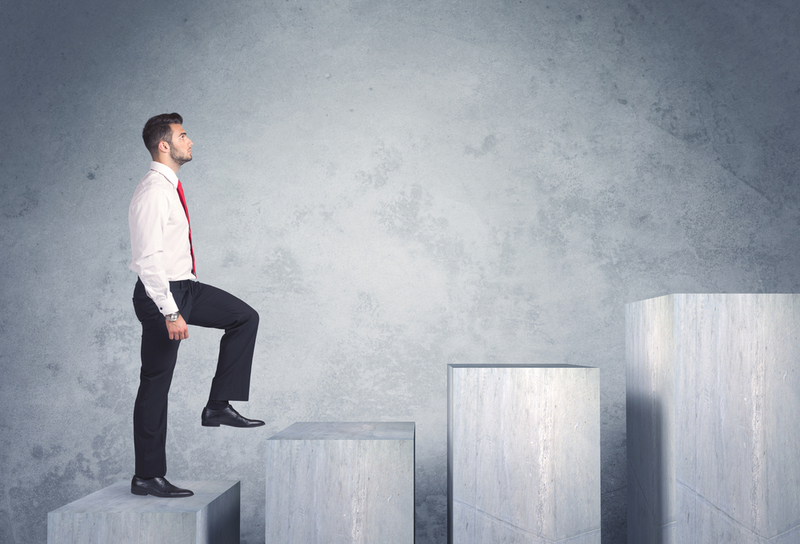 How does Lithium-ion battery technology compare to Lead-Acid battery technology? than lead-acid batteries. Download our free ebook to learn how you can increase your overall return on investment.